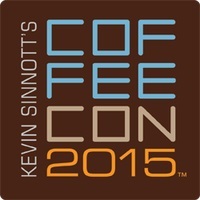 CoffeeCon Chicago is coming to town this Saturday at Morgan Manufacturing (401 N. Morgan St.) from 9 am to 4 pm. This festival differs from other national coffee conventions in that it's largely designed for coffee consumers and home brewers, not coffee professionals. Whether you're simply looking to cut ties with your Keurig or you're a manual-method master, there will likely be something here for you. General admission grants attendees access to unlimited coffee tastings from twenty different roasters, panel discussions led by top industry experts, prize giveaways, and interactive classes on topics ranging from how to use a Chemex or Areopress to latte art and grind technique. Local exhibitors include Bowtruss, Metropolis, Ipsento, Big Shoulders, and Halfwit, although regional favorites--such as Madcap and Stone Creek Coffee--will also be on hand. Kenneth Davids, coffee writer and editor of the Coffee Review, will also lead a ticketed tasting seminar where participants will sample several coffees and learn about the factors that influence the character of particular beans. General admission tickets ($35), which include everything except the tasting seminar ($50), are available through Eventbrite. 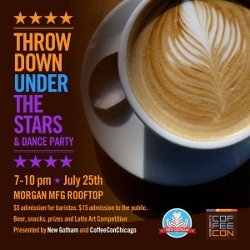 After the festival, head up to the rooftop for a special "Throwdown Under the Stars" and dance party hosted by New Gotham from 7 to 10 pm. Tickets are $15 at the door for the general public and snacks and beer will be served. Think your latte art has what it takes to win? Sign up here while spots are still available.